Get ready for the Christmas Holidays with this Christmas Pattern Pot Holder featuring 2 of Santa’s reindeer. Personalize one line for yourself or give as a gift wishing them a Merry Christmas. Spread some holiday cheer when you use this Custom Monogram Printed Christmas Pattern Pot Holder in your kitchen when retrieving fresh baked cookies from the oven. Santa will appreciate the gesture & help you from burning yourself before his arrival. Personalize up to 2 lines. This hot pad is 8” x 8”, white with silver quilted heat resistant back and hanging loop. Make of layered quilted polyester that protects against heat. These pot holders are safe for use or can be hung for decoration. Due to the nature of this being a padded fabric product, natural creases and folding may occur. 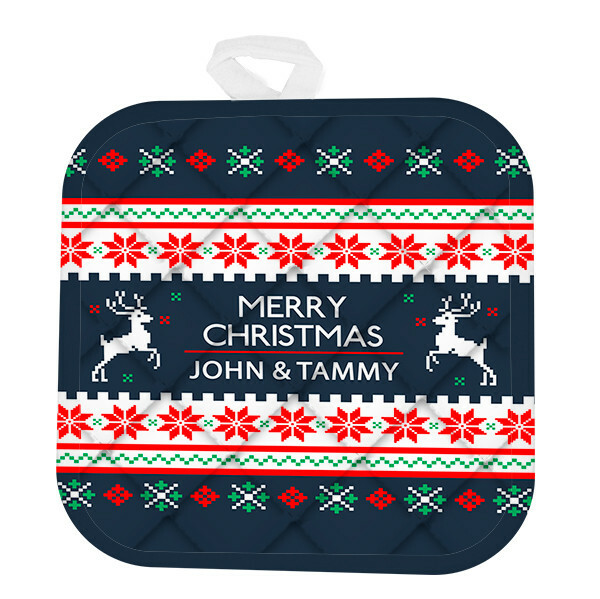 Don’t delay & order your decorative Personalized Monogram Christmas Pattern Pot Holder today.